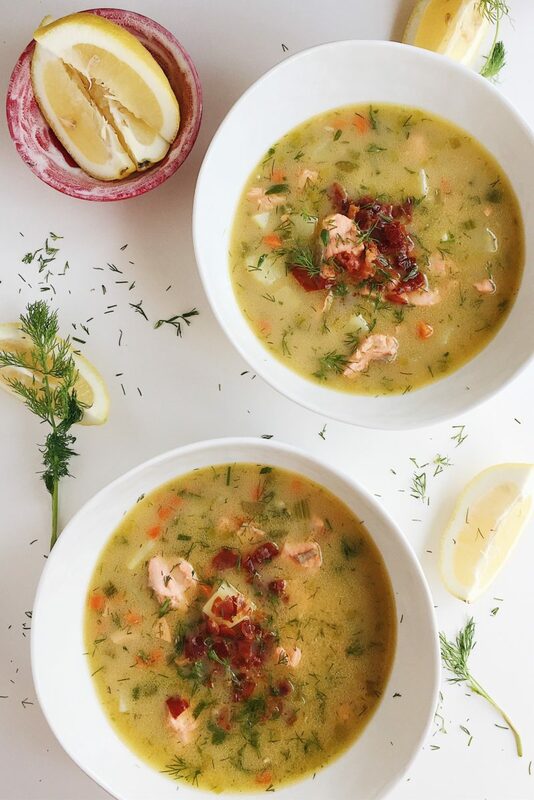 This Whole30 Salmon Chowder is delicious, creamy, healthy, and hearty. It’s so comforting that I guarantee you won’t miss the gluten or the dairy. Chowder, without a doubt, is a comfort food to me. “Comfort” is such a controversial way to describe a food, isn’t it? We’re always told that we’re not supposed to get emotional when it comes to food. That it should only be seen as substance. Is it possible to have an unhealthy relationship with food? Of course. That’s the reason I love doing the Whole30 once a year. It helps me re-access my unhealthy habits, differentiate between cravings and hunger, and reacquaint myself with whole foods. But I wouldn’t be a professional chef, culinary school graduate, and food writer/blogger without having an emotional relationship with food. 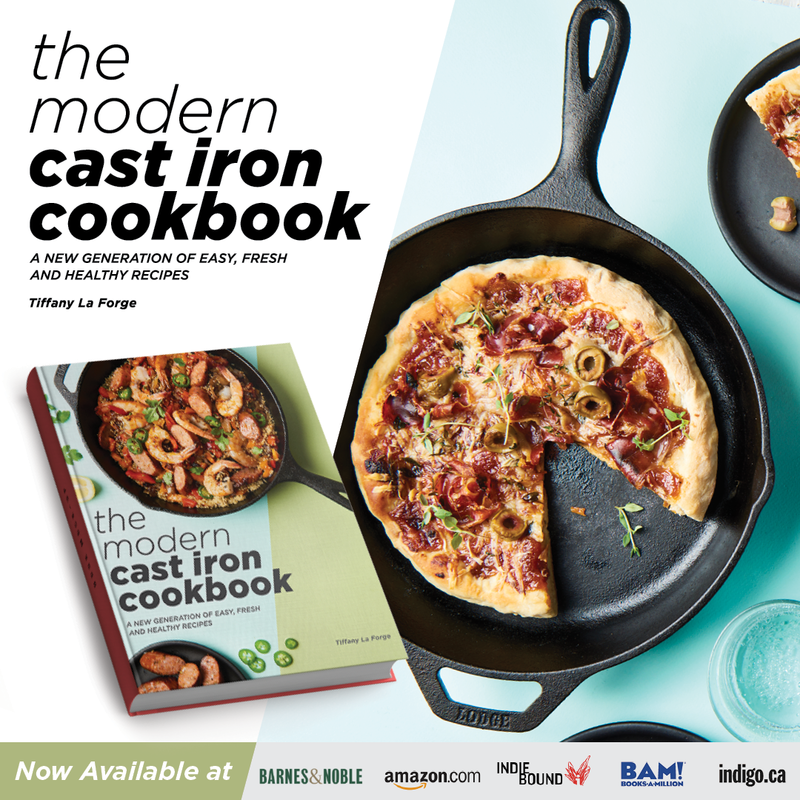 Most of my life has been spent thinking about, making, and writing about food. “Comfort foods” for me are not meals that are necessarily bad for you. Sure, some are, but that’s not what makes them comforting. What makes them comforting is the memories and nostalgia behind them. 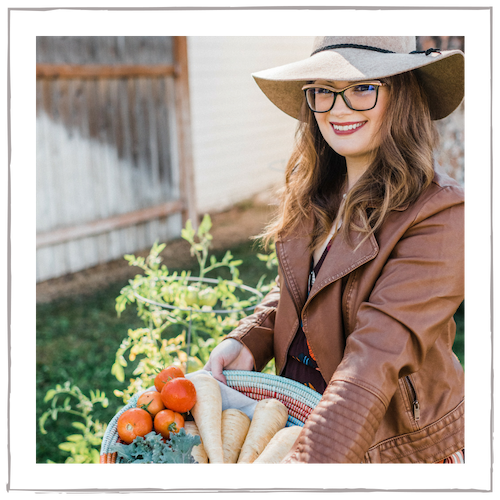 Many of my comfort foods revolve around pasta, since I am Italian and grew up in Northern New Jersey with a large Italian family. As I have gotten older, I have found new comfort foods, attached to new memories. Like salmon chowder, for example. It was kind of odd how salmon chowder became a comfort food for me, really. I have always liked chowder, sure. But last year I went through a bit of a salmon chowder phase, if you will. A year and a half ago, before this blog was anywhere close to being successful, my husband and I took this side job together. I had lost my job as a Pastry Chef due to developing severe agoraphobia, a truly horrible thing to both pronounce and to experience. I couldn’t work outside of the house at that time. I could barely leave the house. So helping my husband with this side job worked well for me, because it got me out of the house to practice my CBT therapy and I was with him. We worked nights for a while making deliveries, and it was actually fun. At least, I thought it was fun. I’m not so sure he did, especially after working his normal full-time job. It was a horrible time in my life, and that silly grocery delivery job was one of the main reasons I overcame it, honestly. I could interact with people, make income, and I was getting used to being in crowded places again. I had worked full-time for a dozen years straight before that, and I was not used to sitting around the house all day, alone with my own thoughts and overwhelming anxieties. But one downfall of the job was that we were always starving. We worked busy night shifts without breaks and without having time to eat dinner. One night, we went into my favorite Portland Whole Foods to grab something quick to eat after our shift. I noticed that they had salmon chowder. I hadn’t seen it at any other Whole Foods before, and I’ve been to many considering my husband managed one! That specific Whole Foods was the only one in Portland that made it, and it was delicious. It was seriously incredible. Full of fresh, huge chunks of salmon, so much fresh dill, and a creamy broth that was savory and balanced. I absolutely loved their salmon chowder. It became kind of a tradition to get it once a week for dinner after working a busy shift, and I always looked forward to it. Shopping for and delivering groceries was a bit labor-intensive, especially when you had a $1,000 Costco order. But it was more emotionally intensive on me than anything, considering I was fighting off panic attacks constantly in crowded places and dealing with intense, high levels of anxiety. I truly looked forward to that comforting, creamy, soul-nourishing bowl of soup. It represented a bit more to me than just a meal. It represented a glimmer of hope, and a path to healing. 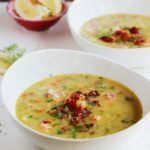 So I have tried to recreate it here with this Whole30 Salmon Chowder, a bit healthier but still just as delicious and comforting. 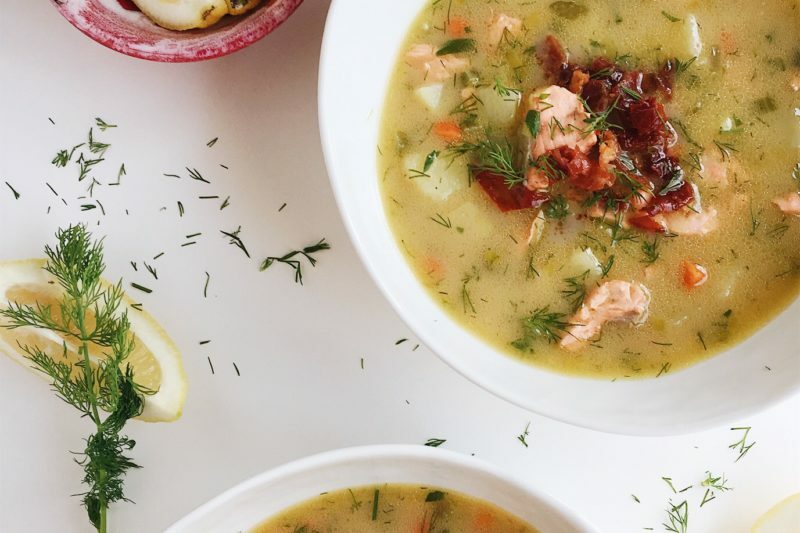 A Whole30 Salmon Chowder means that there’s no gluten and there’s no dairy, two things you will almost always find in a classic chowder. A roux (butter and flour) is the most popular way to thicken a chowder, and I find that most of them have far too much cream. 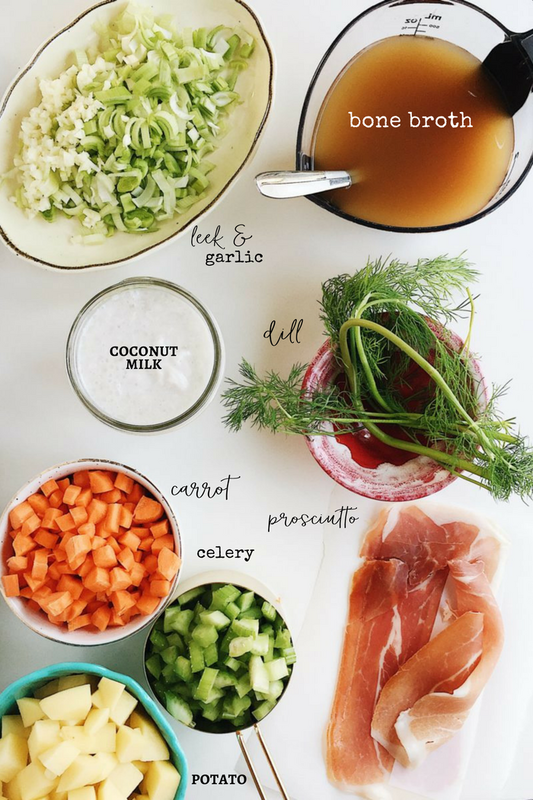 To make this Whole30 salmon chowder creamy without dairy, we add full-fat coconut milk. 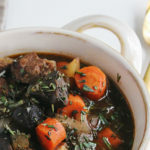 That gets combined with rich, savory bone broth and plenty of fresh vegetables. Crispy, salty prosciutto and fresh dill finish the dish. The most important part here is the salmon itself. 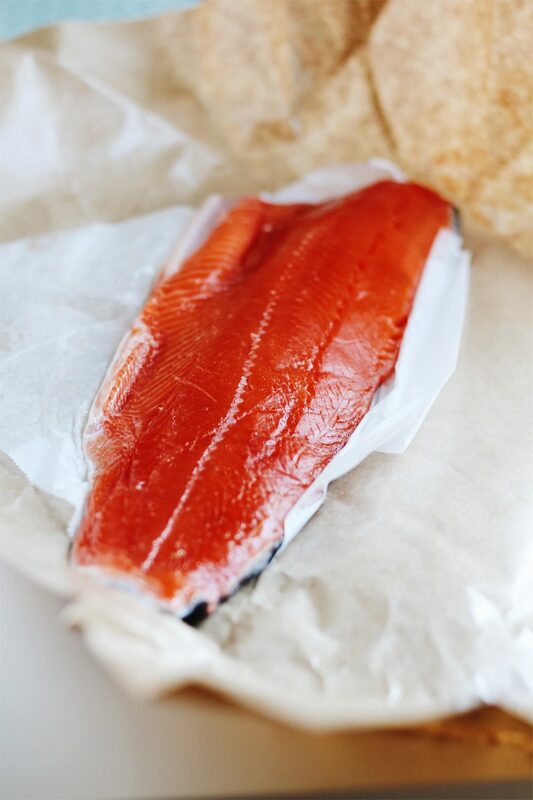 I strongly suggest finding a high-quality wild-caught salmon. 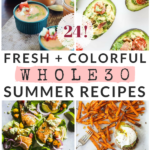 I hope that you make and enjoy this Whole30 Salmon Chowder someday soon! What are your favorite comfort foods, and why are they comforting for you? Let me know in the comments below. Heat a deep soup pot or dutch oven with 1 tablespoon of olive oil and cook the prosciutto until crisp and browned. Using a slotted spoon, remove the prosciutto and set aside. To the same pot, add the additional tablespoon of olive oil and the leek, carrots, and celery. Cook the vegetables until they start getting a bit of color. Season with sea salt and pepper. Add in the garlic. Add in the chicken bone broth, potatoes, lemon zest, and bay leaf. Bring to a simmer. Simmer until the potatoes are tender, about 15-20 minutes. Stir in the coconut milk. Meanwhile, de-skin the salmon and cut into 1-inch pieces. Add in the salmon and cook until the salmon is just cooked through and flaky, about 3-4 minutes. Check the seasoning, adding additional sea salt and pepper if necessary. Gently stir in the fresh parsley and dill. 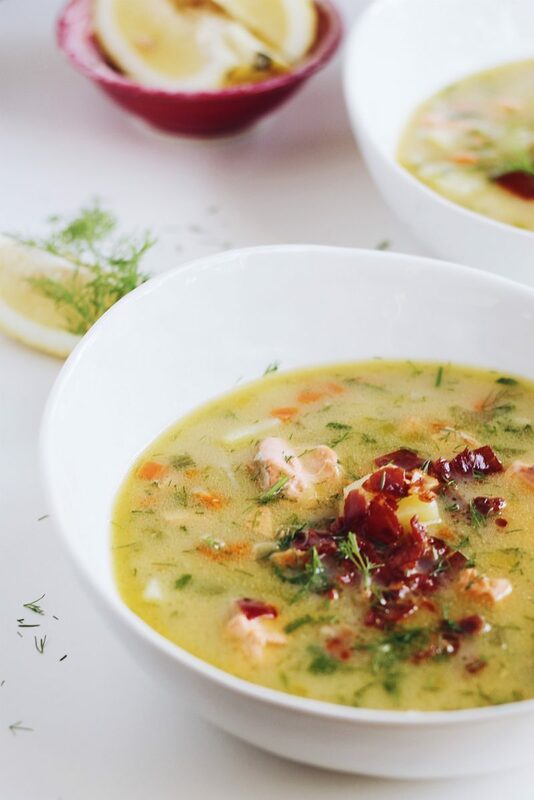 Discard the bay leaf and serve the chowder topped with the prosciutto, a sprinkling of herbs, and lemon wedges. I love salmon chowder. This looks fantastic. Do you think it could be made in an Instant Pot? 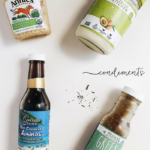 My husband and I did the Whole30. It took us 60 days but we did it! I’m always on the lookout for flavorful dishes. What’s the point of eating something of a sawdust like nature except to completely undermine anything good or of value. Hi Roberta! I have never tried it in the IP but am sure it could work. Let me know if you give it a shot. Good for you for doing it for 60 days! Amazing! 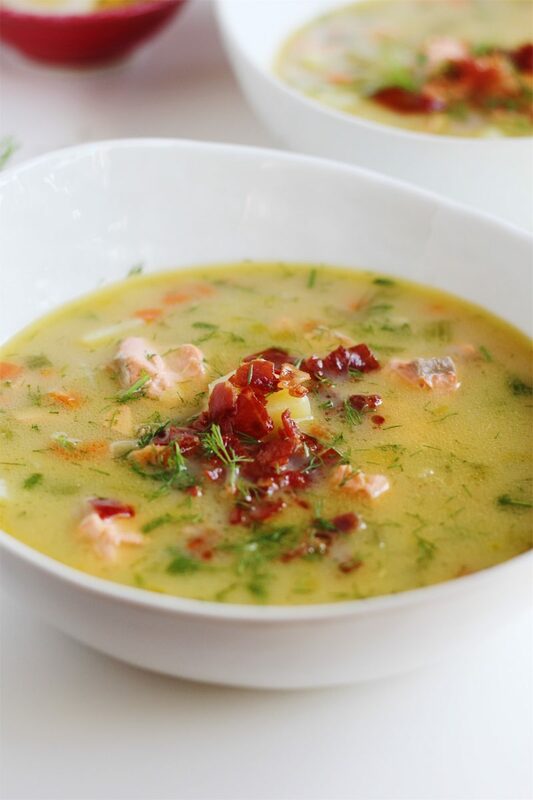 On page 90 is a recipe for New England Fish Chowder. It’s from this recipe that I used the directions to convert your recipe. Since it was being cooked at pressure, I made the vegetables more chunky so they wouldn’t turn out mushy. I do love the idea of leeks. It was good but we think it needed something more. Tastebuds are like thumbprints – it’s one of the things that makes us individuals. Next time I plan on using dried spices. I buy frozen wild caught salmon from Costco. It’s the most economical for our budget and is easily and quickly thawed in a sink of cold water. Just made the chowder and it is SO GOOD. Can you freeze this? Or will that mess with the texture? Thanks! I’m so glad you liked it, Rachel! I wouldn’t recommend freezing this as the texture of the salmon would suffer from freezing the soup. 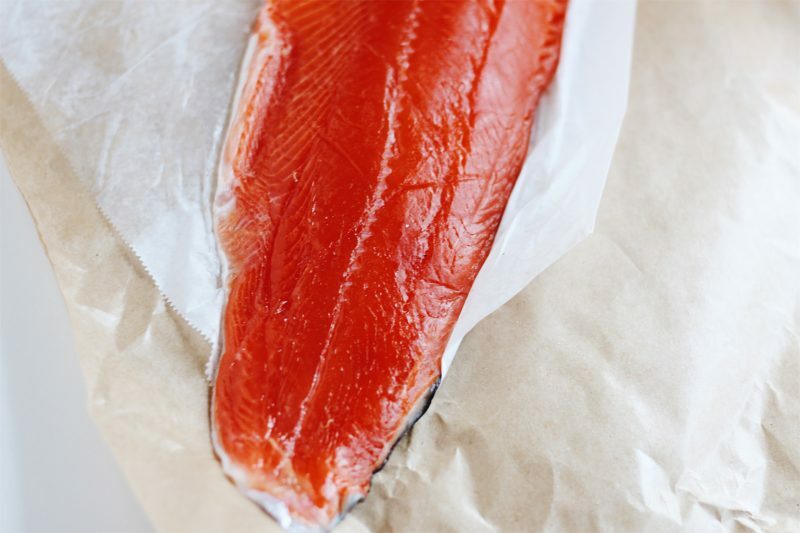 It doesn’t have milk in it, so you could likely freeze the soup without the salmon and then add in the salmon to cook during the reheating process. Made this last night. Didn’t have all ingredients on hand, so I subbed bacon for the prosciutto, and used half chicken broth and half fish stock. Wound up adding some of the lemon juice, and blended the soup a bit before adding the coconut milk and salmon. Next time, we’ll add a little more potato. 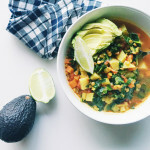 But even without those changes, this soup is a total hit. Absolutely delicious! We absolutely loved this!!!! SOOO good… we’ll definitely be making this more times in the future. Thanks! Awesome, Chris! So glad you loved it! 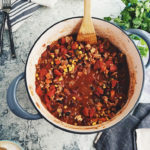 I made this recipe yesterday and it was so good and easy to make. Thank you for a wonderful recipe! I made this and I was so surprised with how much flavor is in it! Absolutely delishes, and I don’t feel guilty for getting a second helping! Thank you, Shay! 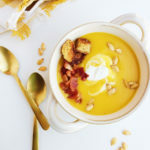 I loved this soup too and tried really hard to create a version that satisfied me as much as my favorite super creamy (and not so healthy!) chowder. I am so so happy you enjoyed it! Happy Cooking! Ha! I’m all about the emotions when it comes to food; it’s generally the thing I turn to when emotions are running too high, be it really happy emotions, or sad ones. I love the look of this chowder! Oh man. 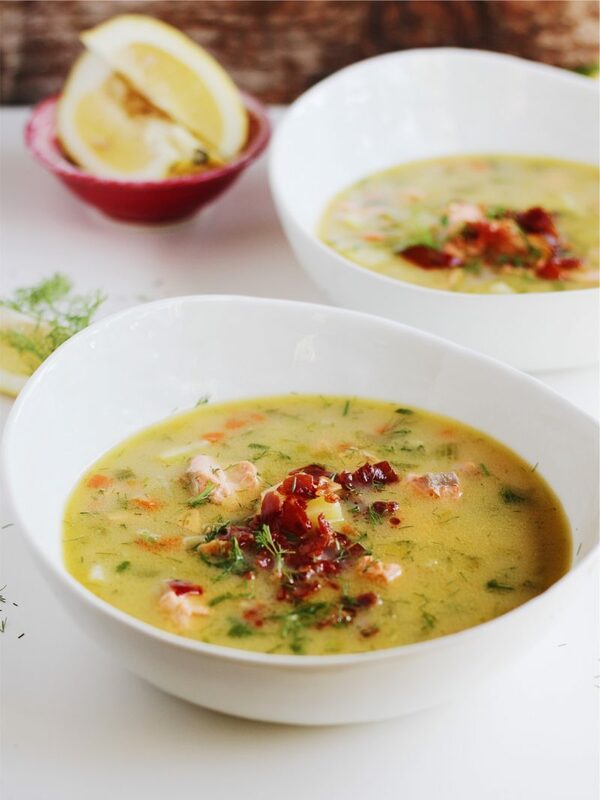 Salmon Chowder. That totally brings me back to those days where it felt there wasn’t anything that wonderful magical bowl of soup couldn’t cure. Thanks for sharing!